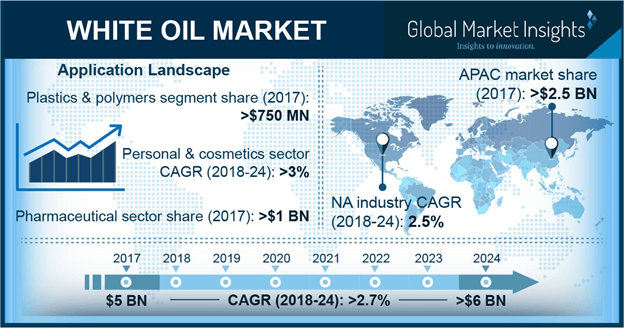 White Oil Market size is estimated to exceed USD 6 billion by 2024; according to a new research report by Global Market Insights, Inc.
Increasing product innovations in the personal care industry along with the enhancement of cosmetics quality across the globe have resulted in an increasing demand for white oil based products. Benefits such as skin compatibility, low irritant, and resistance to bacteria and other unwanted elements are projected to boost the white oil market growth. Increasing demand for durable, pure, and sustainable lotions, oils, emollients, and creams has improved the industry development. High application potential in plastic & polymer industry, particularly in synthetic aromatic polymer applications including polystyrene (PS) will propel the white oil market growth. The product is also significantly used in manufacturing PVC, LDPE, and TPE. The high product usage as gear lubricants and hydraulic fluids in industrial applications including machinery, compressors, and tanks will boost industry share. White oils are used in several laxatives, ointments, and excipients under the pharmaceutical industry. Increasing consumption for the treatment of bee mites is expected to provide a positive outlook for product demand. Increased use of high-grade white oil in aromatherapy and the production of biomedicines, gelatin capsules, ointment and lotions are projected to provide new opportunities for the market growth in the specified time frame. Fluctuating crude oil prices due to political and economic uncertainties may impact the product price trends. Geopolitical events often result in supply disruption, output loss, and incompetency in market functioning might restrain the white oil market growth. North America white oil market will witness growth over 2.5% CAGR from 2018 to 2024. The presence of key manufacturing companies such as Exxon Mobil, Sonneborn, and Chevron Corporation will drive regional growth. These players have implemented capacity expansion strategy to meet high demand from end-use industries such as cosmetics & personal care, plastic & polymers and pharmaceuticals, thereby fostering product penetration. Asia Pacific market registered more than USD 2.5 billion in terms of revenue in 2017. High product adoption rate in agricultural, textile, plastic and food processing industries will foster business growth. Furthermore, the transformation of the region into a manufacturing hub owing to favorable FDI policies will create lucrative opportunities for industry participants. The global white oil market is moderately fragmented in nature due to the presence of several multinational companies and regional manufacturers. Key industry players include Sinopec Corporation, Exxon Mobile, Chevron, Sonneborn, JX Nippon, Royal Dutch Shell., British Petroleum and Sasol. Numerous companies are involved in partnerships, collaborations, mergers & acquisition, product innovation and portfolio expansion to enhance their industry footprint. For instance, in 2018, FUCHS PETROLUB acquired Chevron’s white oils and food machinery specialty lubricant business to enhance their product offerings to food lubricant customers.